Headstrong and outspoken, Eileen frustrates her brother's wishes, as, through the auspices of her uncle, General Moritz O'Connell of the Imperial Austrian Army, she, along with her ebullient elder sister, Abigail, spend the ensuing richly-dramatic and eventful years at the court of the Empress Maria Theresa in Vienna. 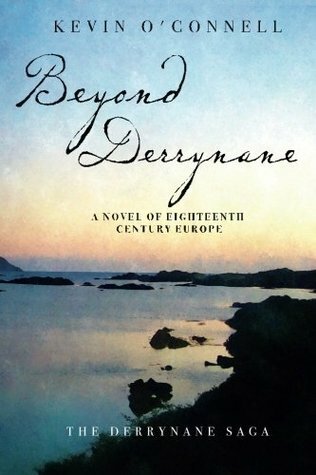 The sisters learn to navigate the complex and frequently contradictory ways of the court--making a place for themselves in a world far different from remote Derrynane. Together with the general, they experience a complex life at the pinnacle of the Habsburg Empire. Poor Eileen. She had such a hard time of it. She is first forced to marry a guy who is way older than she is. Sure, he is nice, but he takes forever to really warm up to her and even remotely like her and then he dies. She is sent back to her family and her brother is already lining up husbands for her. C'mon give the girl some mourning time! Through some events she ends up taking her sister Abigail to Austria with her uncle. This was an interesting read. Eileen was an interesting character and I am curious to follow her story further. Abigail was entertaining; I think I liked Abigail more than I liked Eileen honestly...maybe it was because I see a little of myself in her. Eileen's late husband was nice, but he was old and didn't last long so I didn't really grow too fond of him. Everyone was meh. Eileen's brother was a jerk. He needed a swift kick in the shins. The beginning was super sloooooooooooow. I didn't truly get hooked to the story until about halfway or so when Eileen arrived in Austria to serve in the court of Empress Maria Theresa. There was a lot of character building and world-building in the first half. Maybe a little too much, but I think it was needed. Now, when the ending came, I was upset, I wanted it to keep going. I really want to see what is next for Eileen and her sister. Well, I know my history and I know what is going to happen, but I want to see how Eileen handles everything. I am really glad the author made sure to announce the month, year, and location. There was a little bit of jumping around and I would've been so confused without those indications. This was an excellent opening book to the saga. It wasn't amazing, but it was good. I really feel like this was a set-up for some real good drama in the upcoming books. I can't wait!! In the end, this was pretty good. The beginning was super slow, but once you got past the character and world build-up, it got way better. The characters were interesting and the story was addicting. Poor Eileen! I am curious to see what is in store for her in the next part of the saga. I for sure recommend this if you like historical fiction. Out of five stars, I'll give this 3. Monday should be banned but I like your review! Yessss mondays should be banned.